What Indicates It Needs Cleaning? How do you know whether it's time to get it cleared out? There are signals you can look for without checking the attic itself! If you or anyone else in the home have allergies or breathing troubles like asthma and experience negative symptoms even indoors, this can mean that the air quality is low and is a side-effect of a dirty attic. Your energy bill may also be steadily rising over time from dust trapped in the ducts that slow down airflow. 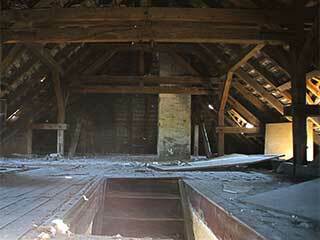 As for the attic itself, check for discoloration of wood or belongings, which is a sign of mold. There may also be droppings or greasy spots indicating that rodents are present. Dust in your attic is more than just messy, it causes a lot of trouble all over your home. It can easily pollute the air that circulates through to keep the temperature stable, hence that lowered air quality that can aggravate allergies and worse. It also gets sucked into the ducts, clogs them eventually, and slows airflow. This is why the air conditioning and heater must run more to compensate, and why your energy spending grows over time. Pests see the mess as an invitation to make themselves at home and will do so by damaging your belongings and the wood through gnawing. Rodents love to tear up insulation for nesting, and their waste can spread all sorts of diseases. Mold is equally a health hazard, as its spores are dangerous to inhale, and it will eat away at the attic too. Our technicians are ready to get to work as soon as possible in getting your attic pristine and safe as well! We use the best equipment available to get the entire space completely cleared out, and do so carefully so there's no risk of further air pollution. It'll all be over before you know it, and you can move on with your day! Call Attic Cleaning Irvine today, and we'll get your attic sparkling in no time!